“L’Apres-Midi d’un Foehn, Version I,” left, and “Us/Them” are currently on stage at Chicago Shakespeare Theater. The work of two theater companies – one from Belgium and the other from France – are paying all-too-brief visits to Chicago Shakespeare Theater stages at the moment. Catch both of these very short shows this weekend if you possibly can. If not, try everything in your power to see “Us/Them,” which has a slightly longer run. With the arrival of Bronks’s “Us/Them,” a mesmerizing choreo-poem inspired by the horrific 2004 terror attack by Chechen rebels on a large primary school in the Russian town of Beslan, Chicago Shakespeare’s “Big in Belgium” project – a revelatory showcase of the work of three different cutting-edge theater companies from that small European country – is coming to an end. 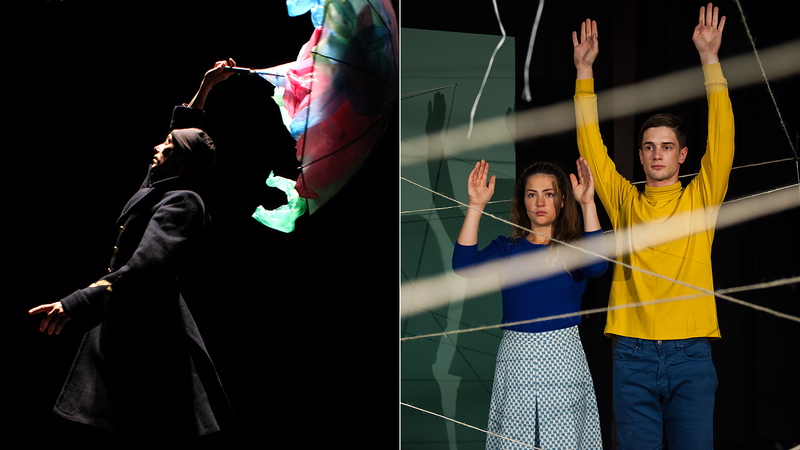 All three productions have been wildly audacious, thought-provoking, inventively devised and superbly performed. But “Us/Them” is the one that will continue to haunt you for a long time to come. Written and directed by Carly Wijs and created with Thomas Vantuycom, it features a pair of heart-shattering and utterly captivating performances by Gytha Parmentier and Roman Van Houtven, who look like young teenagers but might be slightly older. Mesmerizing actors who move with the natural grace and expressiveness of dancers who can brilliantly disguise their formal technique, the two are at once playful, guileless, knowing and phenomenally in tune with each other. “Us/Them” is not at all a documentary, but it brings to vivid life the shattering story of what happened over the course of three brutal days of captivity and mayhem as a group of heavily armed Islamic militants hell-bent on gaining Chechen independence invaded the school, held its occupants hostage for three days, and, in the wake of what some have deemed a clumsy response by the Russian authorities, left more than 330 people dead (186 of them children), and many others emotionally scarred for life. It was sweltering hot on Sept. 1, 2004 when more than a thousand parents and children gathered at Beslan’s School #1 to celebrate the first day of classes. And then came the sound of gunfire, initially assumed to be fireworks. Before long, everyone was herded into the gym where the terrorists rigged up a maze of wires and took turns keeping their foot on the explosive device that could be used to blow them all to pieces. The show’s set, designed by Stef Stessel (with lighting by Thomas Clause and sound by Peter Brughmans) is minimalist but brilliant, with the two actors using yellow chalk to outline the layout of the school on the stage floor. They then engage in the creation of a complex mazelike cross-hatching of twine that suggests how the terrorists wired the gym so that it could be blown up at any moment. But it is the vividly alive and teasingly competitive and flirty relationship between Parmentier (a girl of luminous beauty and wit), and Van Houtven (a fleet yet gangly boy) – both of whom speak impeccable English – that is of the essence here. And their relationship is its most exquisite in a final gesture – not to be revealed here – that brings the whole nightmarish event to a close, and also offers a telling comment on an aspect of the media coverage. Most of the parents on the scene were mothers and grandmothers, with all the kids hoping that their fathers might zoom in from work and heroically save the day. The music very wittily conjures (and pokes fun at) classic Russian anthems. And the kids’ attitudes about the Chechens are probably exactly the sort of thing they picked up at home (“The men are pederasts and the women have mustaches”). But Wijs also found a clever way to explain the terrorists’ demands. For all that happened in the wake of the Beslan siege you will need to do some independent reading. Sadly, you will not have to learn about the very different sort of attacks that in recent years have turned the schoolchildren and teachers in this country into victims, too. Bronks’s “Us/Them” runs through Feb. 3 at the Chicago Shakespeare Theater Upstairs, 800 E. Grand Ave. on Navy Pier. For tickets ($38-$48) call (312) 595-5600 or visit chicagoshakes.com. Running time is one hour with no intermission. Running just through Sunday at Chicago Shakespeare’s The Yard (now winningly reconfigured as an intimate circular space for an audience of about 100) is “L’Apres-Midi d’un Foehn, Version I,” a 30-minute one-man show from France’s Compagnie Non Nova. It is one of the many entries in the altogether wondrous and surprising third biannual Chicago International Puppet Theater Festival, and I can attest to the fact that you will never see anything quite like it. I also promise that will leave the theater asking this single essential question: Who could even begin to imagine an absurd flight of total fantasy like this one, let alone figure out a way to turn it into a reality? It all begins as the lean, deadpan Ouvard, dressed in an overcoat and knit watch cap, arrives on the stage (which is encircled by six rotary metal floor fans) with a pink plastic bag. He proceeds to paste it to the floor with bits of scotch tape and clip it with a pair of scissors. As a fan is turned on it inflates and becomes a slightly puffy but enchantingly airborne figure. And gradually it is joined by an entire “corp de ballet” that somehow “dances” into a series uncannily beautiful but laugh-inducing pas de deux and ensemble formations. I will tell you no more. It is all quite beyond description. Just experience it if you can. And while I would love to see the reaction of an audience full of children to “Foehn,” in a sense its real magic is its ability to conjure pure childlike delight in adults. For tickets call (312) 595-5600 or visit chicagoshakes.com/lapres.